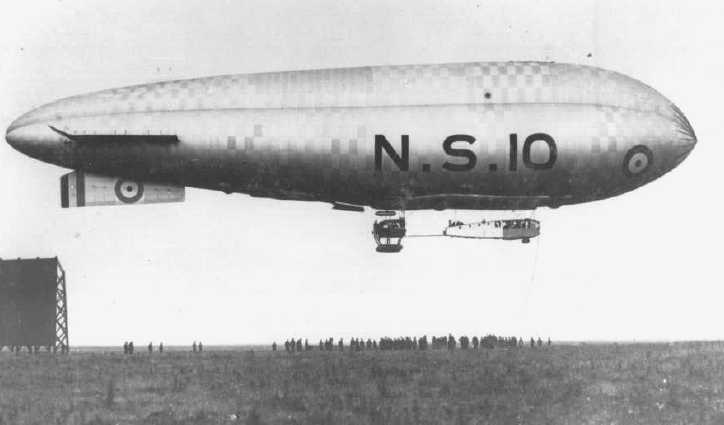 With more requirements put on the Airship Service to provide more aerial cover for shipping, the final designs of the non-rigid culminated with the most efficient ships, the North Sea Class. 1. Capability to carry out flights of considerable duration. 3. The necessary lift to carry an ample supply of fuel. 4. Adequate arrangements to accommodate the crew in comfort. If these could be fulfilled the authorities were satisfied that ships possessing these qualifications would be of value to the Fleet and would prove efficient substitutes until rigid airships were available. The North Sea, as may be gathered from its name, was intended to operate on the east coasts of these islands. The form used for the new design was not only larger than bvefore, but more streamlined, looking quite similar in outline to the SS ships. The first ship, when completed and put through her trials, was voted a success, and the others building were rapidly pushed on with. When several were finished and experience had been gained, after long flights had been carried out, the North Sea airship suffered a partial eclipse and people were inclined to reconsider their favourable opinion. 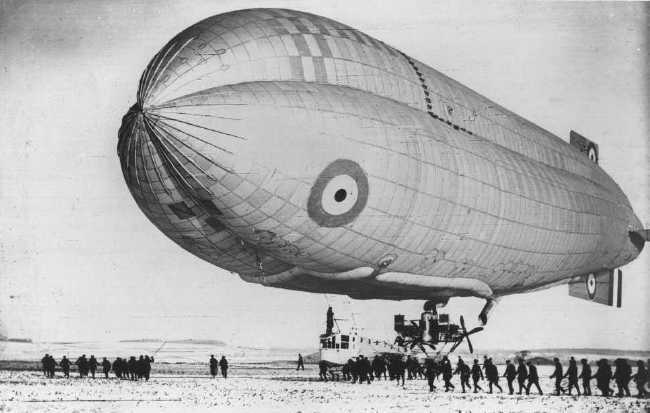 Thus it was that for many months the North Sea airship was decidedly unpopular, and it was quite a common matter to hear her described as a complete failure. The main cause of the prejudice was the unsatisfactory design of the propelling machinery, which it will be see,, later was modified altogether, and coupled with other improvements turned a ship of doubtful value into one that can only be commended. The envelope is of 360,000 cubic feet capacity, and is designed on the Astra-Torres principle for the same reasons as held good in the cases of the Coastal and C Star. All the improvements which had been suggested by the ships of that class were incorporated in the new design, which was of streamline shape throughout, and looked at in elevation resembled in shape that of the S.S. airship. Six ballonets are fitted, of which the total capacity is 128,000 cubic feet, equivalent to 35.5 per cent of the total volume. They are fitted with crabpots and non-return valves in the usual manner. The rigging is of the Astra-Torres system, and in no way differs from that explained in the previous chapter. Nine fans of the internal rigging support the main suspensions of the car, while similar fans both fore and aft provide attachment for the handling guys. Auxiliary fans on the same principle support the petrol tanks and ballast bag. - Four gas and six air valves in all are fitted, all of which are automatic. - Two ripping panels are embodied in the top lobe of the envelope. The N.S. ship carries four fins, to three of which are attached the elevator and rudder flaps. The fourth, the top fin, is merely for stabilizing purposes, the other three being identical in design, and are fitted with the ordinary system of wiring and kingposts to prevent warping. The petrol was originally carried in aluminium tanks disposed above the top ridges of the envelope, but this system was abandoned owing to the aluminium supply pipes becoming fractured as the envelope changed shape at different pressures. They were then placed inside the envelope, and this rearrangement has given every satisfaction. To the envelope of the N.S. is rigged a long covered-in car. The framework of this is built up of light steel tubes, the rectangular transverse frames of which are connected by longitudinal tubes, the whole structure being braced by diagonal wires. The car, which tapers towards the stern, has a length of 85 feet, with a height of 6 feet. The forward portion is covered with duralumin sheeting, and the remainder with fabric laced to the framework. Windows and portholes afford the crew both light and space to see all that is required. In the forward portion of the car are disposed all the controls and navigating instruments, together with engine-telegraphs and voice pipes. Aft is the wireless telegraphy cabin and sleeping accommodation for the crew. A complete electrical installation is carried of two dynamos and batteries for lights, signalling lamps, telephones, etc. The engines are mounted in a power unit structure separate from the car and reached by a wooden gangway supported by wire cables. This structure consists of two V-shaped frameworks connected by a central frame and by an under-structure to which floats are attached. The mechanics' compartment is built upon the central frame, and the engine controls are operated from this cabin. In the original power units two 250 horse-power Rolls Royce engines were fitted, driving propellers on independent shafts through an elaborate system of transmission. This proved to be a great source of weakness, as continual trouble was experienced with this method, and a fracture sooner or later occurred at the universal joint nearest to the propeller. When the modified form of ship was built the whole system of transmission was changed, and the propellers were fitted directly on to the engine crankshafts. At a later date 240 horse-power Fiat engines were installed, and the engineers' cabin was modified and an auxiliary blower was fitted to supply air to the ballonets for use if the engines are not running. In the N.S. ship as modified the car has been raised to the same level as the engineers' cabin, and all excrescences on the envelope were placed inside. This, added to the improvement effected by the abolition of the transmission shafts, increased the reliability and speed of the ship, and also caused a reduction in weight. The leading dimensions of the ship are as follows: length, 262 feet; width, 56 feet 9 inches; height, 69 feet 3 inches. The gross lift is 24,300 lb. ; the disposable lift, without crew, petrol, oil, and ballast, 8,500 lb. The normal crew carried when on patrol is ten, which includes officers. As in the case of the Coastal, a gun is mounted on the top of the envelope, which is approached by a similar climbing shaft, and guns and bombs are carried on the car. These ships have become notorious for breaking all flying records for non-rigid airships. 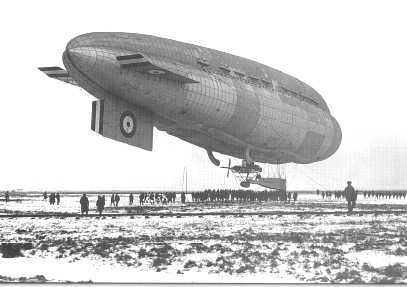 Even the first ship of the class, despite the unsatisfactory power units, so long ago as in the summer of 1917 completed a flight of 49 hours 22 minutes, which at the time was the record flight of any British airship. Since that date numerous flights of quite unprecedented duration have been achieved, one of 61 1/2 hours being particularly noteworthy, and those of upwards of 30 hours have become quite commonplace. Since the Armistice one of these ships completed the unparalleled total of 101 hours, which at that date was the world's record flight, and afforded considerable evidence as to the utility of the non-rigid type for overseas patrol, and even opens up the possibility of employing ships of similar or slightly greater dimensions for commercial purposes. N.S. 6 appeared several times over London in the summer months of 1918, and one could not help being struck by the ease with which she was steered and her power to remain almost stationary over such a small area as Trafalgar Square for a quite considerable period. The flights referred to above were not in any way stunt performances to pile up a handsome aggregate of hours, but were the ordinary flying routine of the station to which the ships were attached, and most of the hours were spent in escorting convoys and hunting for submarines. In addition to these duties, manoeuvres were carried out on occasions with the Fleet or units thereof. From the foregoing observations it must be manifest that this type of ship, in its present modified state, is a signal success, and is probably the best large non-rigid airship that has been produced in any country. These ships departed from the use of aeroplane technology for the gondolas and their own design and layout was created. There were two main cars, one for the engine, and one for the Command Cabin. These were often joined together by a small walkway slung below the tri-lobe envelope. The enclosed control cabins enabled the airships to have a longer endurance as it gave the crews some comfort, with sleeping quarters and cooking facilities. The kitchen cooking facilities were heated by the exhaust gasses, piped through from the engines. Two of the most famous NS class ships were NS7 & NS8. Both of these ships were based at Rosyth in Scotland and at the end of the war, they escorted the surrendered German fleet back to Rosyth. One North Sea Class ship was destined for use in America. The Aircraft Record card is for NS 14, built at Kingsnorth in late 1918 with Wheelwright modified cars. Packed up and shipped to America for US Navy, 22 April, 1919. Given Navy Bureau serial number A5580. Sent to Wingfoot Lake N A S, Suffield, Ohio, for evaluation.Arrived on 17 May. Not inflated.On 13 December, transferred to Hampton Roads, Norfolk, Virginia. Arrived on 30 January, 1920. Subsequent US Navy history unknown. Turned over to US Army 22 September, 1925. Stricken from the Navy List 28 January, 1926. So far no records have come to light to determine whether this ship was ever inflated and flown in the United States. We would be interested to know if NS 14 was ever flown in the US.